The present lot by Pierre-Philippe Thomire (1751-1843), maître fondeur-ciseleur in 1772, is related to a candelabrum by the bronzier now in the Grand Trianon, Versailles (inv. T 68c) illustrated in H. Ottomeyer, P. Pröschel et al., Vergoldete Bronzen, Munich, 1986, vol.I, p.393, fig. 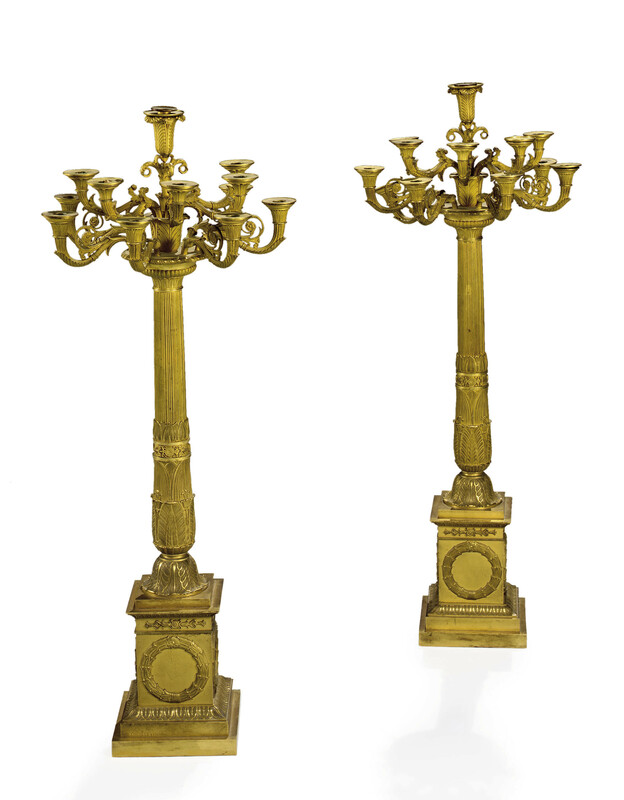 5.17.12; to a further pair of candelabra also signed 'Thomire à Paris', sold at Tajan, 12 December 1995, lot 122; and another pair, sold more recently, from The Royal House of Hanover, Schloss Marienburg, Sotheby's, 5-15 October 2005, lot 1525. Born into a family of ciseleurs, Thomire began working with renowned bronzier Pierre Gouthière (1732-1813) and ciseleur-doreur du roi Jean-Louis Prieur (d. circa 1785-1790), before opening his own workshop in 1776. Famed for his production of finely-chased gilt-bronze objets de luxe, a large quantity of which were commissioned by the Royal household, Thomire frequently collaborated with marchands-merciers such as Simon-Philippe Poirier, the latter's successor, Dominique Daguerre, and regularly supplied finely-chased mounts to celebrated ébénistes such as Adam Weisweiler (maître in 1778) and Guillaume Beneman (maître in 1785). Upon the death of Jean-Claude Duplessis - the artistic director of the Sèvres porcelain manufactory - in 1783, Thomire assumed the role of bronzier to the manufactory, before being made ciseleur de l'Empereur by Napoléon in 1809. Thomire relinquished control of his business to his sons-in-law in 1823. The firm, which had come to be known as Thomire et Cie since 1819 ceased to trade in 1852.